Announcing the latest in PHI's line of scanning XPS microprobe instruments - the VersaProbe III. This multi-technique instrument builds on our industry-leading patented scanning microprobe technology and dual beam charge neutralization and takes it to a higher level. Photograph of a 60 mm diameter sample platen with multiple samples mounted for automated XPS analysis. SXI image of PMMA micro spheres showing the selected analysis area. 2 keV sputter depth profile of a multi-layer PVD TiC/C coating on silicon performed using Zalar rotation to enhance layer definition. 2 keV sputter depth profile of a multi-layer coating on a computer hard disk performed using Zalar rotation to enhance layer definition. 20 kV Ar2500+ sputter depth profile of a 10 µm thick multilayer polymer film showing expected composition and layer definition. 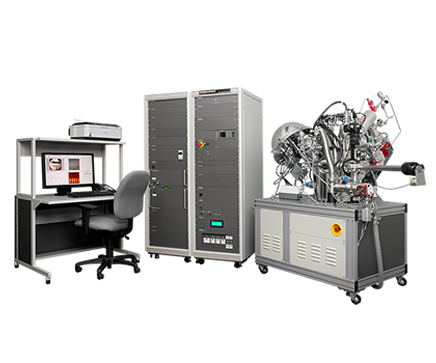 The VersaProbe III test chamber is designed to accept multiple photon and ion sources that are focused at a common point on the sample and controlled from the SmartSoft-VersaProbe user interface. PHI MultiPak is the most comprehensive data reduction and interpretation software package available for electron spectroscopy. The tasks of spectral peak identification, extracting chemical state information, quantification, and detection limit enhancement are addressed with an array of powerful and easy-to-use software tools for spectra, line scans, images and sputter depth profiles. MultiPak can be used on the instrument PC to process data in real time or on an off line PC for report generation. UPS (Ultraviolet Photoelectron Spectroscopy) and LEIPS energy diagrams for a semiconductor are shown in Figure 1 below. Similar to UPS, LEIPS has the relationship hν = Ek + Eb between photon energy (hν), electron kinetic energy (Ek), and electronic binding energy (Eb) measured relative to the vacuum level. However, LEIPS reverses the role of photons and electrons, so one can determine the energy of unoccupied (conduction) levels, not obtainable with UPS. Inverse photoemission spectroscopy (IPES) measures light generated by irradiating a sample with electrons. LEIPS is very different from conventional IPES and measures near ultraviolet light using low energy electrons of 5 eV or less. For this reason, electron beam damage to organic samples is dramatically reduced. On the VersaProbe III, the low energy electron beam is set to a fixed energy and the sample bias is adjusted to sweep the net energy of the bombarding electrons. Generated ultraviolet light of 5 eV or less is selected by a band pass filter on the atmosphere side of the belljar and detected with a photomultiplier tube. A plot is then generated of the photon signal intensity (at a fixed energy band pass filter on the detector) vs. net kinetic energy of the bombarding electrons. Since the photodetector is located outside the belljar, it is easy to select the light energy by replacing the band pass filter. The low-energy electron gun can also be used as a neutralization gun on the VersaProbe III. Figure 3. (left) LEIPS spectrum of copper phthalocyanine thin film sample (10 nm film on ITO) measured with 3 different band pass filters (BPF) (right) Plot of the rising (onset) energy of the LEIPS spectrum vs. the band pass filter energy. Extrapolating to zero onset energy yields the electron affinity. REELS is a surface analysis technique in which a specimen is bombarded with an electron beam (≤ 1000 eV) and the energy distribution of the reflected electrons is measured. This energy distribution contains features corresponding to discrete losses of energy of the reflected electrons due to excited atomic states, valence band transitions, material bandgaps, etc. It also provides information on the type and geometric structure of compounds at the surface of the specimen. REELS measurement can be made by selecting one of the two electron guns as an option of VersaProbe III. Both electron guns can perform REELS measurement with high energy resolution of 0.5 eV or less according to FAT mode (constant energy resolution). The first option for REELS is to get the "add-on" for the AES option by using the LAB6 electron gun as the source of energy. If the AES option is not available on your system, then second option for REELS is a newly developed, low-cost electron gun with a tungsten source is available. REELS spectrum of SiO 2 thermal oxide film (25 nm) on Si wafer. The peak rises from the energy 8.8 eV lower than the incident electron, and the band gap (* 1) of the SiO 2 film can be known. Due to the rebound effect of hydrogen atoms, hydrogen-derived energy loss peak appears. You can compare the relative contents of hydrogen from the intensity of this peak. The diamond (sp 3) and graphite (sp 2) can be used as a reference to determine the bonding state of various DLC films (* 2). By removing the surface contamination without damaging by the gas cluster ion gun (GCIB), it is possible to analyze the carbon material more precisely.